10/24/2015 ** This book would make an EXCELLENT book study for schools looking for ways to bring non-test score indicators of student achievement to their own communities. The student voices of ways teachers can help them learn are especially powerful. 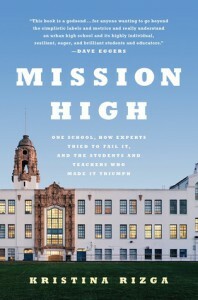 After 4 years immersed in the day-to-day school life at Mission High, Rizga wrote at highly compelling, descriptive book about the ways teachers bring rigor to their instruction; build strong, positive relations with their students; and successfully help their students prepare for life after high school, even as the state and federal departments of education label the school as "failing" (on the basis of standardized test scores). The chapters contain alternating perspectives: case studies of students, case studies of teachers, and mini-histories of the progress of educational reform. This is a MUST read for those who 1) want to see how a school labeled as "failing" is actually make a tremendously positive impact in the community and for students. OR 2) for those who believe in test-based "reforms" and want to see what true reform could look like.